Helping keep a community alive is literally what the work of volunteers in a North Galway parish is doing. Possible life-saving devices have been rolled out in locations throughout the some 400 homes in the region and hundreds of people have been trained in basic life-saving skills. When a few people came together in Milltown in 2008 to discuss the idea of getting a defibrillator (AED) machine for the village it quickly became apparent that one just wouldn’t do. Whose life do you choose not to try and save by restricting the machine’s location to one place? One unit was never an option, recalls Chairperson of the Milltown AED group Padraig Coyne who now, eight years on, looks at the AED map for the parish which clearly shows the location of 14 AED units. It’s estimated that over 5,000 people die from cardiac arrest each year in Ireland and between 70 and 80 per cent of cardiac arrest occur out of hospital. It can happen at any time at any age and the quicker someone intervenes the more likely that person will survive. 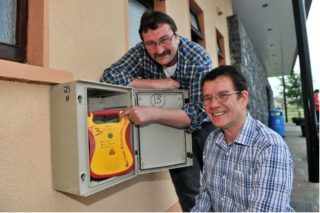 Milltown, the county’s Tidiest Town, has been commended nationally for its impressive community spirit and the AED initiative is another example of the tenacity and pull- together attitude of those who live there – whether they were born and bred in the village or are relatively new to the district. The AED committee came together on a formal basis in 2009 and has succeeded in providing and maintaining 14 defibrillators, AED ad CPR training for hundreds of people and raising €56,000 to make it all happen, and more importantly, that it keeps happening. The first call-out for volunteers to become trained in using the AED was overwhelming. Some 200 people attended a public meeting in the community centre and 150 individuals were trained in the first phase. Everyone had heard stories of loved ones suddenly collapsing in school yards, in the car, on the sportsfield, at work, on the pavement or in the kitchen. “How would you be able to help, is a question people asked themselves,“ reflects Padraig. The British Heart Foundation in advocating CPR training has stated that people are too afraid to intervene when someone has an apparent heart attack as they lack the skills and confidence to help. Being able to help and save a life is what the Milltown group want to share throughout their parish. As with most community projects, the money for the initiative had to be found locally. Doors were knocked on, card games, quizzes, and dances were held and the quest to raise the €30,000 needed began. Padraig, a familiar part of local life in Milltown, recalls how the group hadn’t a penny to start off with and were very grateful to the Community Council for giving them a loan of €3,000 to get off the ground. It was a crucial kickstart that they managed to repay quite quickly. A local family donated the first defibrillator in Milltown and this also spurred the drive to have many more of them to ensure anyone living in or passing through the parish and its immediate hinterland would have access to the life-saving device if needed. No one envisaged that the group would still be going eight years later or that more than €56,000 would have been raised in that time to keep it all going. Padraig says everyone in the area has been hugely supportive. He knows too well how hard it is for people to keep on giving when so many worthy local causes are also seeking funds. The Milltown group is a registered charity and from the very start the committee were adamant that everything it did was transparent and every cent accounted for. A small community of varying households, ages and sizes were putting their hands in their pockets and the money had to be spent properly and everyone was entitled to know where it went. It wasn’t just the AEDs that had to be paid for – there were other considerations and added costs such as boxes, insurance, equipment, batteries and administration. The group didn’t envisage how big the undertaking would be when they first came together and they certainly hadn’t anticipated how much paperwork and research would be involved. “It simply had to be done properly. People had given us money and we have to have answers to any question that they put to us,” says Secretary Charles Carne. There are two AED units in Milltown village centre (at the community centre and GAA pitch) but the others are located on smaller roads leading off either side of the N17 – a route travelled by thousands of motorists each day. All of the 14 AED locations are outdoors and are on the ambulance service database. All of the boxes housing the units are unlocked. Making the units as accessible as possible has been a major focus of the group. Placing the units in a building which might be locked at weekends or evenings didn’t interest the group. Having someone search for a key at the crucial time when they needed to use the device was also viewed as wasting time that could be spent on helping save a life. Fortunately none of the units have been called upon to do their life-saving duty during the first seven or so years of their existence. However, one of the units was stolen and was costly to replace. “None of the units is locked and it was something we decided on from the outset. Anything that caused a delay was viewed as defeating the purpose of having the units there,” explained Padraig. “It was very unfortunate to have lose one in 2011. It was taken from a location on the main road and was never returned. It was of no value to anyone but it cost a lot for us to replace it,” said Padraig. There isn’t any lucrative black market in second-hand defibrillators and the machine won’t work unless it registers a heartbeat that requires its use. “It’s not even like someone can use it on friends as a prank – it simply won’t work. It was useless to whoever stole it,” Padraig added, who described the act of vandalism as almost stealing a life. Saving lives is the simple message and aim of the parish project. The committee mapped out the parish and drove around, timing between various places before deciding on the final locations of the AEDs, to ensure there was one within five minutes’ driving distance of another throughout the parish and hinterland. The Milltown units edge towards Ballindine on the Galway-Mayo border and the AED group there has a similar project. The AED units are checked at least once a month and the group is currently organising the replacement of the long life batteries. This, while it will only happen every seven years, is costly. Each battery costs €350 plus VAT. Breda Hyland and Ray McGrath are two of four training instructors in the group. Training and refresher courses are held regularly during the year and while those attending aren’t as many as in the early years – the overall numbers in the locality who now know how to use the units properly are increasing. The training doesn’t just cover the use of the unit. Crucial life-saving skills such as CPR in adults and children as well as choking are covered. The two to three hours the training takes in intensive but hugely beneficial. But AEDs are also designed so that they can be used by a person without any training if necessary. They can play a vital role when someone suffers a sudden cardiac arrest as they deliver a shock to the heart to allow it resume its normal beating. Originally a list of people trained in using the AEDs with a contact number was included in the Milltown boxes but this was stopped, again viewed by the committee as a waste of time. “Why waste time reading a list and trying different numbers. People needing to use the unit can ring the 112 number and the emergency service talks them through everything,” Padraig points out. Breda urges people to return for the ten-minute refresher course that quickly updates a trained person’s skills. “The more people who are trained the better. Helping someone suffering a heart attack in the first five to ten minutes is crucial and dramatically increases their chance of recovery,” says Breda. However, Charles stresses that while the AEDs are on the ambulance services’ database, the team of trained people and trainers aren’t paramedics. “No one should be put off by the idea of the training. It is very straightforward and it takes between two and three hours to learn life saving skills which perhaps you might be called upon to put to use,” added Ray. COMMITTEE members: Padraig Coyne, Maureen McHugh, Charles Carne, Dr Gary Curran, Saranna Leonard, Ann Marie Dolan, Ann Connolly, Mary Birmingham, Helen Flattery, Martin Brogan, Olive McWalters, Steven O’Mahony, Rachel Kenny, Ray McGrath and Breda Hyland. AED training is provided free of charge by the Milltown group’s instructors. However, a small donation would be welcomed to help fund administration costs. The next AED training takes place in Milltown Community Centre on Tuesday, June 5 at 7.30 pm. The next revalidation/ refresher course takes place on Tuesday, June 15. For more information contact Training Co-ordinator Mary Birmingham. This page was added on 22/06/2017.